Norton-In-The-Moors St. Bartholomew Parish Register Transcripts Part 1. 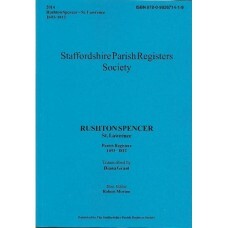 Baptisms, Marriages and Burials 1574 -1751 This is a downloadable ..
Norton-In-The-Moors St. Bartholomew Parish Register Transcripts Part 2. 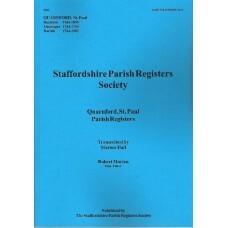 Marriages 1754 -1837 This is a downloadable PDF file (approx 47Mb) ..
Pattingham, St. Chad Parish register transcripts Part 1. 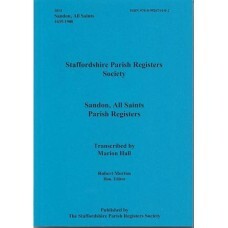 Baptisms 1559 -1812Banns 1754-1801Marriages 1559-1812Burials 1559-1812 300+ pages ..
Penkridge St. Michael and All Angels Parish Register Transcripts Part 1 Baptisms, Marriages & Burials 1575-1735 This is a download..
Penn St. Bartholomew Part 1. Baptisms, Marriages and Burials 1570 -1754 Parish register transcriptsNow with digital index This is a downloada..
Penn St. Batholomew Parish Register Transcripts Part 2 Baptisms 1748-1812 Marriages 1754-1837 Burials 1754-1812 This is a down.. Pipe Ridware St.James Parish Register Transcripts Baptisms 1571-1812 Marriages 1565-1812 Burials 1561-1812 This is a downloa..
Quarnford Parish register transcripts Baptisms 1744 to 1899 Marriages 1744 to 1754 Burials 1744 to 1902 266 pages Book format Publis..
Quarnford Parish register transcripts Baptisms 1744 to 1899 Marriages 1744 to 1754 Burials 1744 to 1902 This is a downloadable PDF file ..
Ranton All Saints Parish Register transcripts Baptisms, Marriages and Burials 1655-1812 This is a downloadable PDF file With Clickable Index ..
Rocester St.Michael Parish register transcripts Baptisms, Marriages and Burials 1565 -1812Now with digital index This is a downloadable PDF f..
Rolleston St. Mary Parish Register Transcripts Part 1 - Baptisms 1569-1620Marriages 1569-1643Burials 1569-1643 This is a downloadable PDF ..
Rugeley St. Augustine of Canterbury Parish Register Transcripts Part 2 Baptisms 1722-1849 Marriages 1722-1854 Burials 1722-1841 ..
Rugeley St.Augustine Parish Register Transcripts Part 1 Baptisms, Marriages and Burials 1569-1722 This is a downloadable PDF..
Rushall - Baptisms 1660 -1685, Marriages 1660 -1734, Burials 1660 -1770 and Pelsall - Baptisms and Burials 1763 -1812 This is a downloadable ..
Rushton Spencer St. Lawrence Parish Register transcripts 1693-1812 186 pages Book format, also available as a download Published by ..
Rushton Spencer St. Lawrence Parish Register transcripts 1693-1812 Baptisms (1693-1812)Banns &n..
Sandon All Saints Parish Register transcripts 1635-1900 300 pages Book format, also available as a download Published by the Staffordshir..
Sandon All Saints Parish Register transcripts 1635-1900Baptisms 1635-1900Marriages 1635-1899Burials 1596-1900 This is a downloadable PDF fileNow..